“Korach took.” These are the opening words of our parashah. With these words, the lid to Pandora’s Box was lifted and the seeds of Korach’s uprising sprouted forth to begin bearing their twisted fruit. Korach took something that didn’t belong to him. But what did Korach actually take? In Hebrew, just like in English, these are two words, vayikach Korach. Hebrew, unlike English, has a special indicator to designate the direct object of a verb. The word, et (את), comes before the direct object in order to let the reader know which object is receiving the action. Since word order is not as critical in Hebrew as in English, this direct object pointer is necessary to distinguish the subject (the one doing the action) from the object (the one receiving the action). The problem with the opening verse of our Torah portion is that this critical word is missing. The Torah explicitly says that he took (from the Hebrew root lakach), but it doesn’t say what he took. Therefore, it is unclear as to what exactly Korach took. Our sages wrestled with this problem as well. The midrash explores this question and proposes various answers to the problem. Midrash Tanchuma proposes that Korach “took” his heart in the wrong direction. This is proven by citing Job 15:12, which asks, “Why does your heart carry you away?” Since it uses this same Hebrew root word to express the idea of one’s heart “taking” a person away, the midrash uses this to explain the situation with Korach. This is similar to how the Bible describes the hardening of Pharaoh’s heart. It says that God strengthened Pharaoh’s heart. Pharaoh’s heart had already taken him down a destructive path and he had already made up his mind what he was going to do. God simply strengthened his resolve. Many of us have been taken by our hearts and its desires. 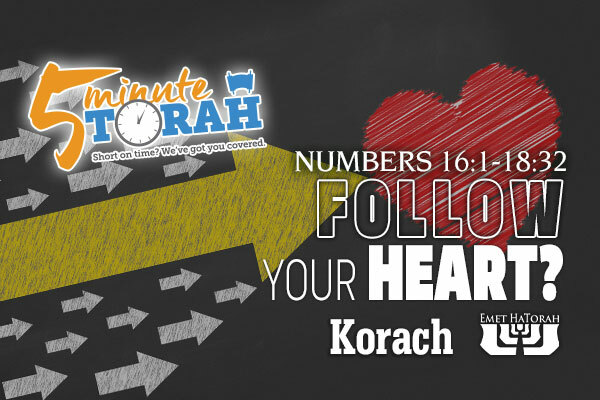 Korach believed that the commissioning of Aaron’s family was a self-serving decision by Moses. His heart led him into rebellion against Hashem and against His anointed. Many of us have been taken on a ride by our heart and its delusions, and invariably someone gets hurt in the process. Keeping our hearts in check can be a laborious task, but one well worth the effort for anyone who desires to remain close to the LORD and to others. Another way to understand Korach’s taking is that he took men. How? The midrash says his brothers were “taken with words.” Evidently, as the expression goes, Korach had a silver tongue. He could talk almost anyone into siding with him on an issue. Like a con artist or a cult leader takes a person with their clever and smooth words, two hundred and fifty leaders of Israel were taken by Korach to be used as pawns in his game of thrones against Moses. Once they had swallowed Korach’s propaganda they provided him the validation needed to confront his cousin, Moses. He had taken the hearts of his brothers, and turned them against their leader. The heart of man is deceitful above all things (Jeremiah 17:9), and can get us into a lot of trouble if we do not keep our guard up against its deceptions. If we allow ourselves to be taken by our hearts, then we will end up on the same path as Korach and leave destruction in our wake. The rebellious heart of Korach didn’t just lead him to a horrible death, but it also took two hundred and fifty other souls down to the pit with him. The next time you hear someone tell you to follow your heart, you may want to get a second opinion.